The new forecast came out early this morning and it's NOT expected to hit triple digits again today. Or so the National Weather Service says. Read more.. The only White Center location is the county library branch - but here's the full list. Read more..
No shortage of ice this morning - and tomorrow, the forecast says again today, might start with snow. Read more..
Just in from Seattle City Light - a news release saying what they're doing, and what you should be doing, to be prepared - read on: Read more..
From King County, more important words of warning - about your roof. And be sure any storm drains around your house are cleared, too - until this all melts away ... Read more.. 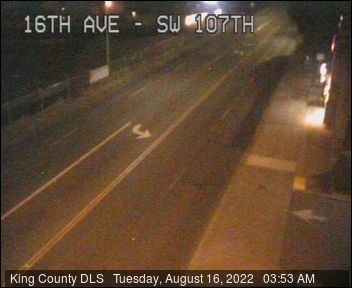 Note the "live" (refresh for the latest image) camera in the right sidebar - it's the only one the county has in White Center; click it for a larger image. ... Read more.. The forecasters were finally right. No word of school changes yet, though (as of 5:25 am). 5:29 AM UPDATE: Seattle Public Schools are CLOSED for today. 5:40 AM UPDATE: Highline Public Schools ... Read more..
Thursday morning: Snow or no? Thursday, December 18th, 2008 Posted in Schools, Weather | Comments Off on Thursday morning: Snow or no? Who knows what we'll wake up to ... the forecast's truly all over the map. To check the status of Highline Public Schools (and others): schoolreport.org. Read more..
That's what the metro area's being called since it's snowing almost everywhere else. The major school districts (Highline and Seattle) closed anyway, just in case. If you're looking for salt/deicer, ... Read more.. Spotted that new business in the works on the far south end of Delridge while out surveying the roads: Tropical fish and pets. About a mile south, we checked McLendon, ... Read more..
Highline Public Schools will be 2 hours late today; Seattle Public Schools is also going to start 2 hours late. Meanwhile, a winter storm watch is up for late Tuesday ... Read more..
From the Metro website just minutes ago: Read more.. The side roads have not been sanded so the hills remain very trecharous and icy. Avoid if you can. Myrtle SW in front of Sanislo Elementary School is an ice-sheet ... Read more..
Highline Public Schools and Seattle Public Schools are both on two-hour delay; those and other districts are listed on SchoolReport.org. Holy Family School is starting at 10 am; Shorewood Christian ... Read more..
Saturday, December 13th, 2008 Posted in Weather, White Center news | Comments Off on Snow! Three-plus hours of snow now, and the National Weather Service says it may not entirely let up before midday Sunday (a "winter weather advisory" is now in effect through noon). ... Read more.. The latest "forecast discussion" from the National Weather Service, published minutes ago (just before 10 am), is backing away from snow possibilities (except "slushy" on "higher hills") around here. Read ... Read more..
(Crossposted from partner site West Seattle Blog, because this is important safety info for our whole area.) Now that the end of the week is within sight, it's time to ... Read more..
We're watching the approaching storm for White Center as well as West Seattle - one of the newest developments is a wind advisory that'll take effect in the metro area ... Read more..